Hello again! I hope your break has made you fit because we are getting into an important chapter. I'm going to tell you about trimming the plane. The trim is a device to help you pilot the pitch. Its function is to modify the forces you can feel from the stick. It is controlled by a trim wheel generally located between the two seats of the pilots. On the opposite, the more you turn the trim wheel backward, the more the stick will push your hand backward. If you don't hold it still, your plane will stabilize a higher pitch. The issue of trimming is to set the trim wheel in order to have the pitch you have chosen staying steady (without any input from you on the stick). Thus, keeping the pitch steady will require less mental capacity, will be less tiring and much more accurate (the human body is poorly made to keep a constant strain on a device with accuracy). Then why don't you trim once and for all ? - The weight and balance of the aircraft from a flight to another (passengers, luggage ...). - The extension or not of the flaps. 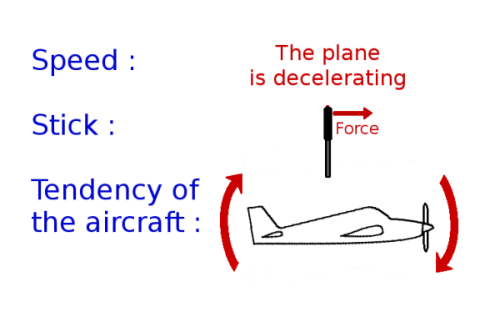 Slowing down the plane has the same effect as turning the trim wheel forward. Assuming that the trim wheel was correctly set before, the more you decelerate, the more your stick will push your hand forward to lower the pitch. (on the contrary, you need to keep a higher pitch in order to stay leveled with less speed). 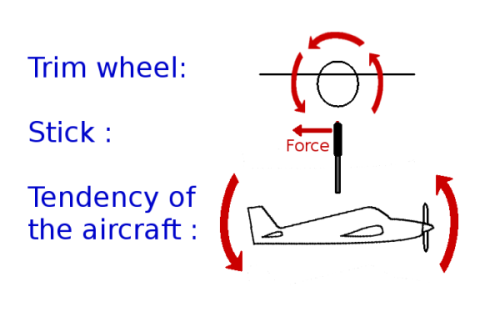 So when the aircraft speed decreases, you will have to turn the trim wheel backward to counter the strain from the stick. Speeding up has the same effect as turning the trim wheel backward. The more you accelerate, the more the stick will push your hand backward to make the pitch higher. So when the aircraft speed increases, you have to turn the trim wheel forward to reduce the strain from the stick. As the strain from the stick depends on the speed, it is useless to try to set your trim with accuracy as long as the speed is not steady. - return the throttle to idle. - pitch up gradually (it depends on the speed of the plane). - turn the trim wheel backward to roughly suppress the stick strains when they appear. - just before reaching the desired speed, set the power needed to maintain this one. - one more time, check the pitch, the power, the speed and the altitude. - improve the accuracy of your trim setting if the speed is correct and steady. To improve the accuracy of your trim setting, you have to release the stick slightly to see which way the pitch is going and counter this variation by turning slightly the trim wheel the opposite way. Voila! This chapter is finished. Being able to trim your aircraft is very important, so don't hesitate to read this chapter again and to take your time. When you feel ready, go to the next chapter to learn some helpful techniques.